Tikk and Kerttunen inform new entrants and nonparticipating governments of the discussions and outcomes of the UN First Committee Group of Governmental Experts (GGE) and discuss prospects for the 2019/2020 GGE. They explain why the Group will not able to provide answers to practical cybersecurity issues facing the majority of states. 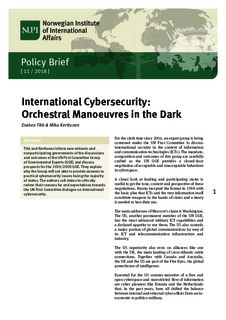 The authors call states to critically review their reasons for and expectations towards the UN First Committee dialogue on international cybersecurity.